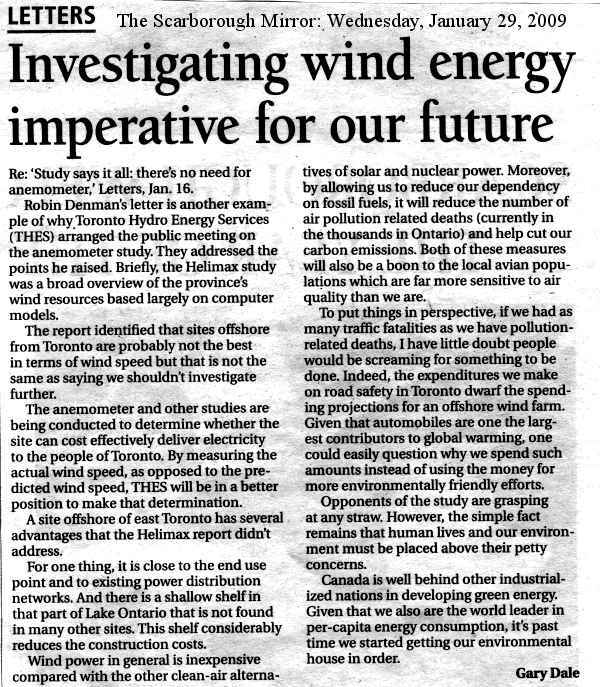 Robin Denman's letter is another example of why Toronto Hydro Energy Services (THES) arranged the public meeting on the anemometer study. They addressed the points he raised. Briefly, the Helimax study was a broad overview of the province's wind resources based largely on computer models. The report identified that sites offshore from Toronto are probably not the best in terms of wind speed but that is not the same as saying we shouldn't investigate further. The anemometer and other studies are being conducted to determine whether the site can cost effectively deliver electricity to the people of Toronto. By measuring the actual wind speed, as opposed to the predicted wind speed, THES will be in a better position to make that determination. A site offshore of East Toronto has several advantages that the Helimax report didn't address. For one thing, it is close to the end use point and to existing power distribution networks. And there is a shallow shelf in that part of Lake Ontario that is not found in many other sites. This shelf considerably reduces the construction costs. Wind power in general is inexpensive compared with the other clean-air alternatives of solar and nuclear power. Moreover, by allowing us to reduce our dependency on fossil fuels, it will reduce the number of air pollution related deaths (currently in the thousands in Ontario) and help cut our carbon emissions. Both of these measures will also be a boon to the local avian populations which are far more sensitive to air quality than we are. To put things in perspective, if we had as many traffic fatalities as we have pollution-related deaths, I have little doubt people would be screaming for something to be done. Indeed, the expenditures we make on road safety in Toronto dwarf the spending projections for an off-shore wind farm. Given that automobiles are one the largest contributors to global warming, one could easily question why we spend such amounts instead of using the money for more environmentally friendly efforts. Opponents of the study are grasping at any straw, not matter how flimsy, to back up their NIMBY fear mongering. However the simple fact remains that human lives and our environment must be placed above their petty concerns. Canada is well behind other industrialized nations in developing green energy. Given that we also are the world leader in per-capita energy consumption, it's past time we started getting our environmental house in order.